credit crunch kitchen: Netflix and stir - how to actually make risotto. Anyway, this epicly well-travelled gammon deserved a good expression of its worth, so after the pressure cooked gammon meal, I saved the cooking liquor and the left over meat for greater things. 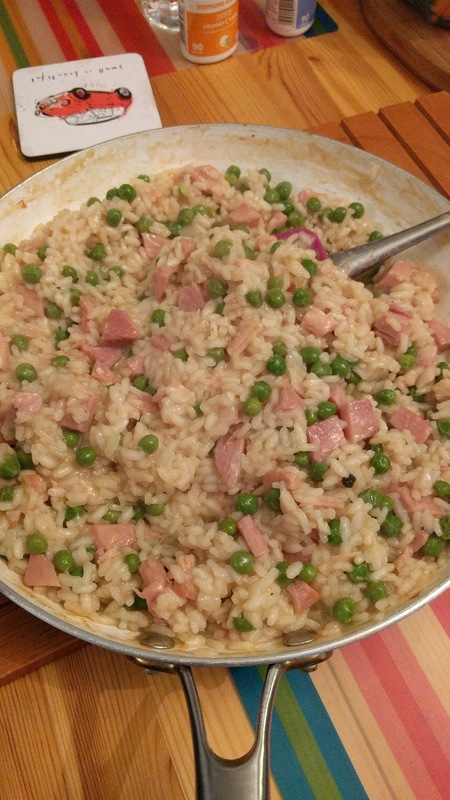 My initial thought had been to make a pea and ham soup, but Papa mentioned risotto, and Big'Un lit up at this idea, so risotto became the new plan. I first put the stock/liquor into a saucepan and slowly brought it to the boil. I used a very well known online Instant Pot gammon cooking recipe, and I had used the usual suspects of flavouring vegetables, as well as Marigold and some fairly ordinary cider in with the water. I had just over a litre, about 2 pints. While the stock came to the boil, I chopped up the left over gammon, as well as a chunk of ham I had bought from the deli when they sell off the ends of the hams very cheaply as they can't slice them so easily. I've always had a fondness for "chunky" ham like this! I got out a large saute pan, and fried this gammon/ham mix of little cubes in some olive oil until it was starting to brown and then I added 2 finely chopped small onions and a tablespoon or so of finely chopped garlic. 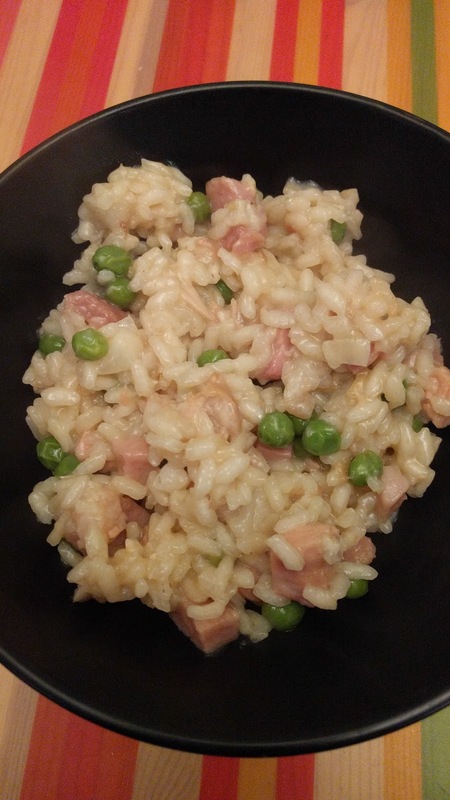 I then added 12oz of risotto rice (I always seem to have 2 part used packets in the cupboard at any given time) and stirred well to coat all the rice in the oil. I then added about a cupful of frozen peas and stirred to mix these too. Now I grabbed my nearest smartdevice, and started up Netflix. This is a very important step. I propped the device up where I could see it while stirring the pan, and started up something easy to watch. Only now did I grab a ladle and pour in a ladle of the simmering stock. And stir. And once that was absorbed, I added another ladleful of hot stock. And so on. You get the picture. At one point I paused the ladling and stirring (but not the Netflix) to use a slotted spoon to remove the stewed veggies and mash them up and put them in a tupperware, but the rest of THAT story is to be found in another post. About Chilli Con Carne. You'll have to be patient. Like with the risotto stirring. I have to be honest and say that after 17 or 18 minutes with very little stock left, I honestly thought I was doing something wrong as the rice was still too hard and there was not enough liquid left to cook it all, surely? But I had faith, and I kept going. (What else could I do, too late for takeaway!) And magically after about 23 mins in total, when all the hot stock was in the risotto, and had been sucked all away by the fat glistening little rice grains, there was a creamy richness to the whole dish, and the pink ham and jewelly green peas made such a colourful dish, I was delighted! A sprinkling of cheese was added at the table to give that special stringy, sticky comfort, freshly ground black pepper for those who like such things, and I have to say, this was a meal EVERYONE enjoyed immensely! And I was happy because I had had a chance to catch up with Netflix for once!